"Kettledrum" redirects here. For the racehorse, see Kettledrum (horse). For the informal afternoon tea gathering, see tea party. Timpani (/ˈtɪmpəni/; Italian pronunciation: [ˈtimpani]), or kettledrums (also informally called timps), are musical instruments in the percussion family. A type of drum, they consist of a skin called a head stretched over a large bowl traditionally made of copper. They are played by striking the head with a specialized drum stick called a timpani stick or timpani mallet. Timpani evolved from military drums to become a staple of the classical orchestra by the last third of the 18th century. Today, they are used in many types of musical ensembles, including concert bands, marching bands, orchestras, and even in some rock. Timpani is an Italian plural, the singular of which is timpano. However, in informal English speech a single instrument is rarely called a timpano: several are more typically referred to collectively as kettledrums, timpani, temple drums, timpano, timp-toms, or simply timps. They are also often incorrectly termed timpanis. A musician who plays the timpani is a timpanist. First attested in English in the late 19th century, the Italian word timpani derives from the Latin tympanum (pl. tympana), which is the latinisation of the Greek word τύμπανον (tumpanon, pl. tumpana), "a hand drum", which in turn derives from the verb τύπτω (tuptō), meaning "to strike, to hit". Alternative spellings with y in place of either or both is—tympani, tympany, or timpany—are occasionally encountered in older English texts. Although the word timpani has been widely adopted in the English language, some English speakers choose to use the word kettledrums. The German word for timpani is Pauken; the French and Spanish is timbales. The Ashanti pair of talking drums are known as atumpan. 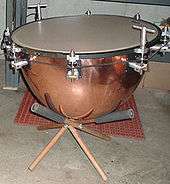 The basic timpani drum consists of a drumhead stretched across the opening of a bowl typically made of copper or, in less expensive models, fiberglass and sometimes aluminum. In the Sachs–Hornbostel classification, the timpani are thus considered membranophones. The drumhead is affixed to a hoop (also called a fleshhoop), which in turn is held onto the bowl by a counterhoop, which is then held by means of a number of tuning screws called tension rods placed regularly around the circumference. The head's tension can be adjusted by loosening or tightening the rods. 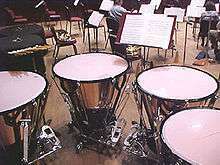 Most timpani have six to eight tension rods. The shape of the bowl contributes to the quality of the drum. For example, hemispheric bowls produce brighter tones while parabolic bowls produce darker tones. Another factor that affects the timbre of the drum is the quality of the bowl's surface. Copper bowls may have a smooth, machined surface or a rough surface with many small dents hammered into it. Timpani come in a variety of sizes from about 84 centimeters (33 inches) in diameter down to piccoli timpani of 30 centimeters (12 inches) or less. A 33-inch drum can produce the C below the bass clef, and specialty piccoli timpani can play up into the treble clef. In Darius Milhaud's 1923 ballet score La création du monde, the timpanist must play the F sharp at the bottom of the treble clef. Each individual drum typically has a range of a perfect fifth. Changing the pitch of a timpani by turning each tension rod individually is a laborious process. In the late 19th century, mechanical systems to change the tension of the entire head at once were developed. Any timpani equipped with such a system may be considered machine timpani, although this term commonly refers to drums that use a single handle connected to a spider-type tuning mechanism. By far the most common type of timpani used today is the pedal timpani, which allows the tension of the head to be adjusted using a pedal mechanism. 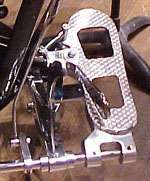 Typically, the pedal is connected to the tension screws via an assembly of either cast metal or metal rods called the spider. A pedal on a Dresden timpano – the clutch (seen here on the left) must be disengaged to change the pitch of the drum. The ratchet clutch system uses a ratchet and pawl to hold the pedal in place. The timpanist must first disengage the clutch before using the pedal to tune the drum. When the desired pitch is achieved, the timpanist must then reengage the clutch. Because the ratchet engages in only a fixed set of positions, the timpanist must fine tune the drum by means of a fine tuning handle. In the balanced action system, a spring or hydraulic cylinder is used to balance the tension on the timpani head so that the pedal will stay in position and the head will stay at pitch. The pedal on a balanced action drum is sometimes called a floating pedal since there is no clutch holding it in place. Professional level drums use either the ratchet or friction system and have copper bowls. These drums can have one of two styles of pedals. The Dresden pedal is attached to the drum at the side nearest the player, and is operated by ankle motion. A Berlin-style pedal is attached by means of a long arm to the opposite side of the drum, and the timpanist must use his entire leg to adjust the pitch. In addition to a pedal, high-end instruments have a hand-operated fine tuner, which allows the timpanist to make minute pitch adjustments. The pedal is on either the left or right side of the drum depending on where it is set up. Most school bands and orchestras below a university level use less expensive, more durable timpani with either copper, fiberglass, or aluminum bowls. The mechanical parts of these instruments are almost completely contained within the frame and bowl of the drum. They may use any of the pedal mechanisms, though the balanced action system is by far the most common, followed by the friction clutch system. Many professionals also use these drums for outdoor performances due to their durability and lighter weight. The pedal is in the center of the drum itself. On chain timpani, the tension rods are connected by a roller chain much like the one found on a bicycle, though some manufacturers have used other materials, including steel cable. In these systems, all the tension screws can then be tightened or loosened by one handle. Though far less common than pedal timpani, chain and cable drums still have practical uses. Occasionally, a player is forced to place a drum behind other items so that he cannot reach it with his foot. Professional players may also use exceptionally large or small chain and cable drums for special low or high notes. A rare tuning mechanism allows the pitch of the head to be changed by rotating the drum itself. A similar system is used on rototoms. Jenco, a company better known for mallet percussion, made timpani tuned in this fashion. In the early 20th century, Hans Schnellar, the timpanist of the Vienna Philharmonic, developed a tuning mechanism in which the bowl is moved via a handle that connects to the base, and the head remains stationary. These drums are referred to as Viennese timpani (Wiener Pauken) or Schnellar timpani. Adams Musical Instruments developed a pedal-operated version of this tuning mechanism in the early 21st century. Like most drumheads, timpani heads can be made from two materials: animal skin (typically calfskin or goatskin) and plastic (typically PET film). Plastic heads are durable, weather resistant, and relatively inexpensive. Thus, they are more commonly used than natural skin heads. However, many professional players prefer skin heads because they produce a warmer quality timbre. Timpani heads are sized based on the size of the head, not the size of the timpani bowl. For example, a 23" drum may require a 25" head. This 2" size difference has been standardized by most timpani manufactures since 1978. Timpanists use a variety of timpani sticks since each stick produces a different timbre. Timpani are typically struck with a special type of drum stick fittingly called a timpani stick or timpani mallet. Timpani sticks are used in pairs. They have two components: a shaft and a head. The shaft is typically made from hardwood or bamboo but may also be made from aluminum or carbon fiber. The head of the stick can be constructed from a number of different materials, though felt wrapped around a wood core is the most common. Other core materials include compressed felt, cork, and leather, and other wrap materials include chamois. Unwrapped sticks with heads of wood, felt, flannel, and leather are also common. Wood sticks are used as a special effect—specifically requested by composers as early as the Romantic era—and in authentic performances of Baroque music. Although not usually stated in the score, timpanists will change sticks—the same piece—to suit the nature of the music. However, the choice of stick during a performance is entirely subjective and depends on the timpanist's own preference and occasionally the wishes of the conductor. Thus, most timpanists own a great number of mallets. The weight of the stick, the size and latent surface area of the head, the materials used for the shaft, core, and wrap, and the method used to wrap the head all contribute to the timbre the stick produces. In the early 20th century and before, sticks were often made with whalebone shafts, wood cores, and sponge wraps. Composers of that era often specified sponge-headed sticks. Modern timpanists execute such passages with standard felt mallets. The two most common grips in playing the timpani are the German and French grips. In the German grip, the palm of the hand should be parallel to the drum head and the thumb should be on the side of the stick. In the French grip, the palm of the hand should be close to perpendicular with drum head and the thumb should be on top of the stick. In both of these styles, as with most percussion grips, the fulcrum consists of the contact between the thumb and middle finger. The index finger is used as a guide and to help lift the stick off of the drum. The American grip is a hybrid of these two grips. Another known grip is known as the Amsterdam Grip, made famous by the Royal Concertgebouw Orchestra, which is similar to the Hinger grip, except the stick is cradled on the lower knuckle of the index finger. A standard set of timpani (sometimes called a console) consists of four drums: roughly 32 inches (81 cm), 29 inches (74 cm), 26 inches (66 cm), and 23 inches (58 cm) in diameter. The range of this set is roughly the D below the bass clef to the top-line bass clef A. A great majority of the orchestral repertoire can be played using these four drums. However, contemporary composers have written for extended ranges. Igor Stravinsky specifically writes for a piccolo timpano in The Rite of Spring, tuned to the B below middle C. A piccolo drum is typically 20 inches (51 cm) in diameter and can reach pitches up to middle C.
Beyond this extended set of five instruments, any added drums are nonstandard. (Luigi Nono's Al gran sole carico d'amore requires as many as eleven drums, with actual melodies played on them in octaves by two players.) Many professional orchestras and timpanists own more than just one set of timpani, allowing them to execute music that cannot be more accurately performed using a standard set of four or five drums and music that requires more than one set of timpani. Many schools and ensembles unable to afford purchase of this equipment regularly rely on a set of two or three timpani, sometimes referred to as "the orchestral three". It consists of 29-inch (74 cm), 26-inch (66 cm), and 23-inch (58 cm) drums. Its range extends down only to the F below the bass clef. A few concertos have been written for timpani. The 18th-century composer Johann Fischer wrote a symphony for eight timpani and orchestra, which requires the solo timpanist to play eight drums simultaneously. Rough contemporaries Georg Druschetzky and Johann Melchior Molter also wrote pieces for timpani and orchestra. For general playing, a timpanist will beat the head approximately 4 inches in from the edge. Beating at this spot produces the round, resonant sound commonly associated with timpani. A timpani roll (most commonly signaled in a score by tr) is executed by rapidly striking the drum, alternating between left and right sticks, extending the duration of the sound as required and allowing increases or decreases in volume. Anton Bruckner's 7th Symphony requires a continuous roll on a single drum for over two-and-a-half minutes. In general, timpanists do not use multiple bounce rolls like those played on the snare drum, as the soft nature of timpani sticks causes the rebound of the stick to be reduced, causing multiple bounce rolls to sound muffled. The tone quality of the drum can be altered without switching sticks or adjusting the tuning of the drum. For example, by playing closer to the edge of the head, the sound becomes thinner. A more staccato sound can be produced by changing the velocity of the stroke or playing closer to the center of the head. There are many more variations in technique a timpanist uses during the course of playing to produce subtle timbral differences. Prior to playing the instruments, the timpanist must clear the heads by equalizing the tension at each tuning screw. This is done so every spot on the head is tuned to exactly the same pitch. When the head is clear, the timpani will produce an in-tune sound. If the head is not clear, the pitch of the drum will rise or fall after the initial impact, and the drum will produce different pitches at different dynamic levels. Timpanists are required to have a well-developed sense of relative pitch, and must develop techniques to tune in an undetectable manner and accurately in the middle of a performance. Tuning is often tested with a light tap from a single finger, which produces a near-silent note that nonetheless matches the tune of the drum when struck with a mallet. Some timpani are equipped with tuning gauges, which provide a visual indication of the drum's pitch. They are physically connected either to the counterhoop, in which case the gauge indicates how far the counterhoop is pushed down, or the pedal, in which case the gauge indicates the position of the pedal. These gauges are accurate when used correctly. However, when the instrument is disturbed in some fashion (transported, for example), the overall pitch of the head can change, thus the markers on the gauges may not remain reliable unless they have been adjusted immediately preceding the performance. The pitch of the head can also be changed by room temperature and humidity. This effect also occurs due to changes in weather, especially if an outside performance is to take place. Gauges are especially useful when performing music that involves fast tuning changes that do not allow the player to listen to the new pitch before playing it. Even when gauges are available, good timpanists will check their intonation by ear before playing. Occasionally, players use the pedals to re-tune a drum while playing it. Portamento effects can be achieved by changing the pitch of the drum while it can still be heard. This is commonly called a glissando, though this use of the term is not strictly correct. The most effective glissandos are those from low notes to high notes and those performed during rolls. One of the first composers to call for a timpani glissando was Carl Nielsen, who used two sets of timpani, both playing glissandos at the same time, in his Symphony No. 4 ("The Inextinguishable"). Pedaling refers to changing the pitch of the drum with the pedal; it is an alternate term for tuning. In general, timpanists reserve this term for passages where the performer must change the pitch of a drum in the midst of playing – for example, playing two consecutive notes of different pitches on the same drum. Early 20th-century composers such as Nielsen, Béla Bartók, Samuel Barber, and Richard Strauss took advantage of the freedom pedal timpani afforded, often giving the timpani the bass line. This chromatic passage from the Intermezzo interrotto movement of Bartók's Concerto for Orchestra requires the timpanist to use the pedals to play all the pitches. One way of executing this passage is annotated here: The lowest and highest drum stay on F and E-flat, respectively. All pedaling is executed on the middle two drums. Each pedal change is indicated by a colored line: red for the larger and blue for the smaller of the middle drums. Since timpani have a long sustain, muffling or dampening is an inherent part of playing timpani. Often, timpanists will muffle notes so they only sound for the length indicated by the composer. However, early drums did not resonate nearly as long as modern timpani, so composers often wrote a note when the timpanist was to hit the drum without concern of sustain. Today, timpanists must use their ear and the score of the piece to determine the actual length the note should sound. The typical method of muffling is to place the pads of the fingers against the head while holding onto the timpani stick with the thumb and index finger. Timpanists are required to develop techniques to stop all vibration of the drumhead without making any sound from the contact of their fingers. Muffling is often referred to as muting, which can also refer to playing the drums with mutes on them (see below). It is typical for only one timpano to be struck at a time, but occasionally composers will ask for two notes to be struck at once. This is called a double stop, a term borrowed from the string instrument vocabulary. Ludwig van Beethoven uses this effect in the slow movement of his Ninth Symphony, as do Johannes Brahms in the second movement of his German Requiem and Aaron Copland in El Salón México. Some modern composers occasionally require more than two notes at once. In this case, a timpanist can hold two sticks in one hand much like a marimba performer would, or more than one timpanist can be employed. In his Overture to Benvenuto Cellini, for example, Hector Berlioz realizes fully voiced chords from the timpani section by requiring three timpanists and assigning one drum to each. He goes as far as ten timpanists playing three- and four-part chords on sixteen drums in his Requiem, although with the introduction of pedal tuning, this number can be reduced. Modern composers will often specify the beating spot to alter the sound of the drum. When the timpani are struck directly in the center of the head, the drums have a sound that is almost completely devoid of tone and resonance. George Gershwin uses this effect in An American in Paris. Struck close to the edge, timpani produce a very thin, hollow sound. This effect is used by composers such as Bartók, Bernstein, and Kodály. A variation of this is to strike the head while two fingers of one hand lightly press and release spots near the center. The head will then vibrate at a harmonic, much like the similar effect on a string instrument. Resonance can cause drums not in use to vibrate, causing a more quiet sound to be produced. Timpanists must normally avoid this effect, called sympathetic resonance, but composers have exploited it in solo pieces such as Elliott Carter's Eight Pieces for Four Timpani. Resonance is reduced by damping or muting the drums, and in some cases composers will specify that timpani be played con sordino (with mute) or coperti (covered), both of which indicate that mutes—typically small pieces of felt or leather—should be placed on the head. Composers will sometimes specify that the timpani should be struck with implements other than timpani sticks. It is common in timpani etudes and solos for performers to play with their hands or fingers. Philip Glass's "Concerto Fantasy" utilizes this technique during a timpani cadenza. Also, Michael Daugherty's "Raise The Roof" calls for this technique to be used for a certain passage. Leonard Bernstein calls for maracas on timpani in both the "Jeremiah" Symphony and Symphonic Dances from West Side Story. Edward Elgar attempts to use the timpani to imitate the engine of an ocean liner in his "Enigma" Variations by requesting the timpanist play a soft roll with snare drum sticks. However, snare drum sticks tend to produce too loud a sound, and since this work's premiere, the passage in question has been performed by striking the timpani with coins. Benjamin Britten asks for the timpanist to use drum sticks in his War Requiem to evoke the sound of a field drum. Robert W. Smith's Songs of Sailor and Sea calls for a "whale sound" on the timpani. This is achieved by moistening the thumb and rubbing it from the edge to the center of the drumhead. Amongst other techniques used primarily in solo work, such as John Beck's Sonata for Timpani, is striking the copper bowls. Timpanists tend to be reluctant to strike the bowls at loud dynamic levels or with hard sticks, since copper can be dented easily due to its soft nature. On some occasions a composer may ask for a metal object, commonly an upside-down cymbal, to be placed upon the drumhead and then struck or rolled while executing a glissando on the drum. Joseph Schwantner used this technique in From A Dark Millennium. Carl Orff asks for cymbals resting on the drumhead while the drum is struck in his later works. Additionally, Michael Daugherty, in his concerto "Raise The Roof," utilizes this technique. For more details on this topic, see Evolution of Timpani in the 18th and 19th centuries. It has been said that the first recorded use of early Tympanum was in "ancient times when it is known that they were used in religious ceremonies by Hebrews." The Moon of Pejeng, also known as the Pejeng Moon, in Bali, the largest single-cast bronze kettle drum in the world, is more than two thousand years old. The Moon of Pejeng is "the largest known relic from Southeast Asia's Bronze Age period. According to Balinese legend, the Pejeng Moon was a wheel of the chariot that pulled the real moon through the night sky. One night, as the chariot was passing over Pejeng, the wheel detached and fell to earth, landing in a tree, where it glowed nearly as brightly as the real moon. This light disturbed a thief who, annoyed, climbed the tree and urinated on it; the thief paid for his sacrilege with his life. The moon eventually cooled and has been preserved as a sacred relic by the local villagers. The drum is in the Pura Penataran Asih temple." Arabian nakers, the direct ancestors of most timpani, were brought to 13th-century Continental Europe by Crusaders and Saracens. These drums, which were small (with a diameter of about 20–22 cm or 8–8½ in) and mounted to the player's belt, were used primarily for military ceremonies. This form of timpani remained in use until the 16th century. In 1457, a Hungarian legation sent by King Ladislaus V carried larger timpani mounted on horseback to the court of King Charles VII in France. This variety of timpani had been used in the Middle East since the 12th century. These drums evolved together with trumpets to be the primary instruments of the cavalry. This practice continues to this day in sections of the British Army, and timpani continued to be paired with trumpets when they entered the classical orchestra. The medieval European timpani were typically put together by hand in the southern region of France. Some drums were tightened together by horses tugging from each side of the drum by the bolts. Over the next two centuries, a number of technical improvements were made to timpani. Originally, the head was nailed directly to the shell of the drum. In the 15th century, heads began to be attached and tensioned by a counterhoop that was tied directly to the shell. In the early 16th century, the bindings were replaced by screws. This allowed timpani to become tunable instruments of definite pitch. The Industrial Revolution enabled the introduction of new construction techniques and materials, in particular machine and pedal tuning mechanisms. Plastic heads were introduced in the mid-20th century, led by Remo. "No written kettledrum music survives from the 16th century, because the technique and repertory were learned by oral tradition and were kept secret. 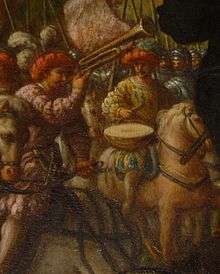 An early example of trumpet and kettledrum music occurs at the beginning of Monteverdi’s opera Orfeo (1607)." Later in the Baroque era, Johann Sebastian Bach wrote a secular cantata titled "Tönet, ihr Pauken! Erschallet, Trompeten! ", which translates roughly to "Sound off, ye timpani! Sound, trumpets!" Naturally, the timpani are placed at the forefront: the piece starts with a timpani solo and the chorus and timpani trade the melody back and forth. Bach reworked this movement in part 1 of the Christmas Oratorio. Ludwig van Beethoven revolutionized timpani music in the early 19th century. He not only wrote for drums tuned to intervals other than a fourth or fifth, but he gave a prominence to the instrument as an independent voice beyond programmatic use (as in Bach's "Tönet, ihr Pauken!"). For example, his Violin Concerto (1806) opens with four solo timpani strokes, and the scherzo of his Ninth Symphony (1824) sets the timpani against the orchestra in a sort of call and response. The next major innovator was Hector Berlioz. He was the first composer to indicate the exact sticks that should be used – "felt-covered", "wooden", etc. In several of his works, including Symphonie fantastique (1830), and his Requiem (1837), he demanded the use of several timpanists at once. 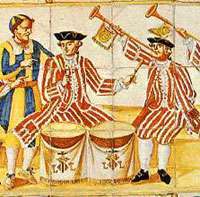 In the 17th and 18th centuries, timpani were almost always tuned with the dominant note of the piece on the low drum and the tonic on the high drum – a perfect fourth apart. Until the early 19th century the dominant (the note of the large drum) was written as G and the tonic (the note of the small drum) was written as C no matter what the actual key of the work was, and whether it was major or minor, with the actual pitches indicated at the top of the score (for example, Timpani in D–A for a work in D major or D minor). This notation style however was not universal: Bach, Mozart, and Schubert (in his early works) used it, but their respective contemporaries Handel, Haydn, and Beethoven wrote for the timpani at concert pitch. Today, even though they're written at concert pitch, timpani parts continue to be most often but not always written with no key signature, no matter what key the work is in: accidentals are written in the staff, both in the timpanist's part and the conductor's score. Later, timpani were adopted into other classical music ensembles such as concert bands. In the 1970s, marching bands and drum and bugle corps, which evolved both from traditional marching bands and concert bands, began to include marching timpani. 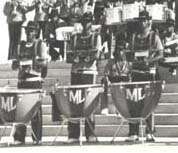 Unlike concert timpani, marching versions had fiberglass shells to make them light enough to carry. Each player carried a single drum, which was tuned by a hand crank. Often, during intricate passages, the timpani players would put their drums on the ground by means of extendable legs, and performed more like conventional timpani, yet with a single player per drum. In the late 1970s and early 1980s, marching arts-based organizations' allowance for timpani and other percussion instruments to be permanently grounded became mainstream. This was the beginning of the end for marching timpani: Eventually, standard concert timpani found their way onto the football field as part of the front ensemble, and marching timpani fell out of common usage. Timpani are still used by the Mounted Bands of the Household Division of the British Army. As rock and roll bands started seeking to diversify their sound, timpani found their way into the studio. In 1959 Leiber and Stoller made the innovative use of timpani in their production of the Drifters' recording, "There Goes My Baby." Starting in the 1960s, drummers for high-profile rock acts like The Beatles, Led Zeppelin, The Beach Boys, and Queen incorporated timpani into their music. 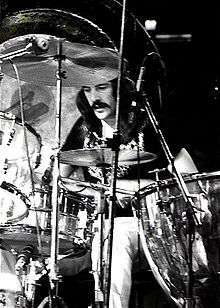 This led to the use of timpani in progressive rock. Emerson, Lake & Palmer recorded a number of rock covers of classical pieces that utilize timpani. More recently, the rock band Muse has incorporated timpani into some of their classically based songs, most notably in Exogenesis: Symphony, Part I (Overture). Jazz musicians also experimented with timpani. Sun Ra used it occasionally in his Arkestra (played, for example, by percussionist Jim Herndon on the songs "Reflection in Blue" and "El Viktor," both recorded in 1957). In 1964, Elvin Jones incorporated timpani into his drum kit on John Coltrane's four-part composition A Love Supreme. 1 2 3 4 5 6 7 8 9 10 11 12 13 Grove, George (January 2001). Stanley Sadie, ed. The New Grove Encyclopædia of Music and Musicians (2nd ed.). Grove's Dictionaries of Music. Volume 18, pp826–837. ISBN 1-56159-239-0. ↑ Natural History IX. 35, 23. Quoted in Chisholm, Hugh, ed. (1911). "Symphonia". Encyclopædia Britannica (11th ed.). Cambridge University Press. 1 2 3 4 5 6 Bridge, Robert. "Timpani Construction paper" (PDF). Retrieved 2008-02-18. ↑ Power, Andrew (April 1983). "Sound Production of the Timpani, Part 1". Percussive Notes. Percussive Arts Society. 21 (4): 62–64. ↑ Slow Motion of Timpani Technique | Percussion Research. Retrieved 7 December 2012. ↑ Hoffman, Stewart. "Playing Timpani | Timpani Techniques | High School Percussion". stewarthoffmanmusic.com. Toronto, CA: Stewart Hoffman Music. Retrieved August 9, 2012. 1 2 3 4 5 Goodman, Saul (1988) . Modern Method for Tympani. Van Nuys, California: Alfred Publishing Company, Inc. ISBN 0-7579-9100-9. ↑ For a thorough scholarly analysis of the Pejeng Moon and the type of drum named after it, see August Johan Bernet Kempers, "The Pejeng type," The Kettledrums of Southeast Asia: A Bronze Age World and Its Aftermath (Taylor & Francis, 1988), 327–340. ↑ Iain Stewart and Ryan Ver Berkmoes, Bali & Lombok (Lonely Planet, 2007), 203. ↑ Yayasan Bumi Kita and Anne Gouyon, The Natural Guide to Bali: Enjoy Nature, Meet the People, Make a Difference (Tuttle Publishing, 2005), 109. ↑ Pringle, Robert (2004). Bali: Indonesia's Hindu Realm; A short history of. Short History of Asia Series. Allen & Unwin. pp. 28–40. ISBN 1-86508-863-3. ↑ Rita A. Widiadana, "Get in touch with Bali's cultural heritage," The Jakarta Post (06/06/2002). ↑ Topographia Hibernica, III.XI; tr. O'Meary, p. 94. ↑ "Company". Remo Inc. Retrieved 2016-05-21. ↑ "Kettledrum; Musical Instrument". Encyclopædia Britannica. 2014-08-19. ↑ Krentzer, Bill (December 1969). "The Beethoven Symphonies: Innovations of an Original Style in Timpani Scoring". Percussionist. Percussive Arts Society. 7 (2): 55–62. ↑ Bowles, Edmund A. (1999). "The Impact of Technology on Musical Instruments". COSMOS Journal. Cosmos Club. Retrieved 2008-02-19. ↑ Del Mar, Norman (1981). The Anatomy of the Orchestra. University of California Press. ↑ See, as an early 20th-century example, the orchestral score of Debussy's Pelléas et Mélisande: through no. 6 non-transposing parts have a key signature of 1 flat but the timpani part has no key signature, in bar 7 of no. 1 the timpani B flat is written in the staff; nos. 29 to 30 non-transposing parts have a key signature of 4 sharps but, again, the timpani part has no key signature, and so on. ↑ For an example where this is not done, i.e. where the timpani part carries the same signature as all the other parts, see the orchestral score of Prokofiev's Piano Concerto No. 1 in D-flat major, where, incidentally, transposing instrument parts are also written at concert pitch with the same key signature as all the other parts. ↑ Beating Retreat page, showing image of mounted bands with timpani in 2008. "Kettledrum". 1911 Encyclopædia Britannica as retrieved from on February 26, 2006. "Timpani" Grove, George (January 2001). Stanley Sadie, ed. The New Grove Encyclopædia of Music and Musicians (2nd ed.). Grove's Dictionaries of Music. Volume 18, pp826–837. ISBN 1-56159-239-0. Chisholm, Hugh, ed. (1911). "Kettledrum". Encyclopædia Britannica (11th ed.). Cambridge University Press.